Zimmerman has, thus far, tweeted the comparison to the Anthony half of Opie and Anthony, Michael Moore, the NAACP, and a Breitbart News editor, as well as the NRA. If Zimmerman’s point is that anyone who uses that gesture is a murderer, then they’re going to have to arrest the entire Garden State Parkway. If you suspect that wasn’t his point, you might be right. Ah, there it is. 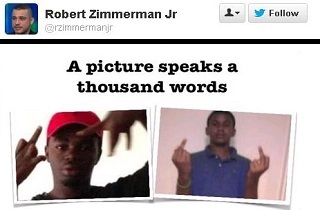 The only thing Trayvon Martin and De’Marquise Elkins have in common is that they are black teenagers who have middle fingers. That’s where it ends, but the differences between the two are many. Trayvon Martin isn’t accused of any crime, while Elkins is accused of murder. Elkins is alive, and will have an opportunity to defend himself. Trayvon Martin is dead, and can’t defend himself against the despicable comparison of himself to an alleged baby-murderer. Even if every word that George Zimmerman says is true, Trayvon Martin was still only guilty of beating a man who was stalking him with a gun. Whatever you think of George Zimmerman’s guilt or innocence, the linchpin of his brother’s media offensive is that George wasn’t racist, and didn’t have any particular antipathy toward black teenagers. Pimping this racist, dimwitted comparison is a direct repudiation of that notion. Maybe the idea is for Robert to be so racist that his brother seems reasonable by comparison? The irony is that even Trayvon Martin’s most vocal advocates have said, all along, that George Zimmerman deserves his day in court, and his presumption of innocence. In advancing this sick comparison, Robert Zimmerman is denying Trayvon Martin the latter, after his brother denied Trayvon the former, and convicting Trayvon of something he was never even accused of. De’Marquise Elkins has a lot more in common with George Zimmerman than he does with Trayvon Martin; they both allegedly killed someone’s child with a gun, and they both will stand trial for those acts. If that comparison offends Robert Zimmerman, Jr., then maybe he can understand why being black and having a middle finger doesn’t make you a baby-killer, and why he should maybe stop making that comparison. POTUS spoke of his Mom acting like a “typical” white woman when encountering blacks. The fate of Sherry West might B why. RZ: . @Only4RM @tommyxtopher Not so fast -bias isn’t mine: it’s the Media’s. Why would media take the word of a few attys spreading lies as fact? RZ: @.tommyxtopher @only4rm I said the media shld ask if that’s why some ppl feel intimidated. Just as they asked blacks what GZ meant2 them. 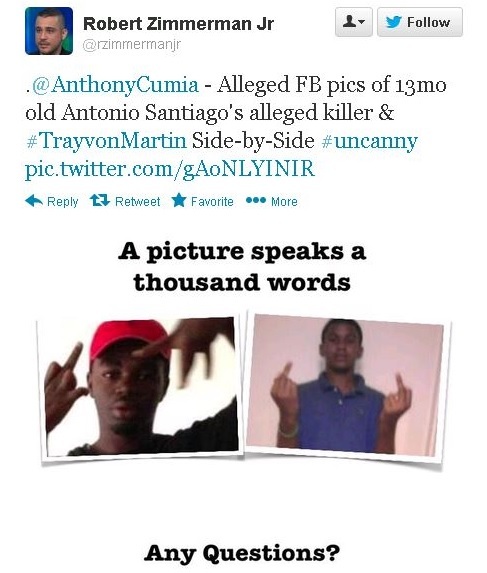 Yeah, it sounds more like Zimmerman thinks the media should be racist like him. He didn’t mention “the media” here, or in the racist tweets of the photo comparison.